It was a long time coming for The Community School girls' soccer team, but Saturday's 4-3 non-conference home victory over the 4A Twin Falls Bruins was a real confidence booster. Senior Gabi Perenchio drilled home a 30-yard shot with less than a minute in regulation giving the Cutthroats their first win over Twin Falls in 15 years, after 13 straight losses to the Bruins. Perenchio and senior Teagen Palmer each scored twice for the Cutthroats (2-2-0, 1-1-0 league) and senior goalkeeper Josie Bunce made 21 saves. The Bruins out-shot the 3A Cutthroats 24-11 but the home team made its shots count on the Sagewillow Farms soccer field. Tenth-year Cutthroat coach Kelly Feldman had never beaten the Bruins, dropping 10 previous meetings by a lopsided 40-10 score since 2002. The only other times the Community School had defeated Twin Falls were 3-0 in 1996 and 3-0 in 1994. Twin Falls now leads the 13-season series 15-3-1. "We had nothing to lose, no pressure, and we played to win," said Feldman. She added, "The girls worked very hard, put the ball in the net and fought hard all game. It was good for our confidence, especially coming off our 4-3 loss at Buhl (that snapped a Cutthroat 28-game High Desert Soccer Conference unbeaten streak Aug. 23)." The coach added, "Erin Hennessy (sophomore) had an outstanding game at center back while Hannah Dies (another sophomore) shut down Twin Falls' star midfielder Claire Goss. Hannah man-marked Claire and her effort made a huge difference for us." Other defenders supporting Hennessy on the back line were senior Hailey Rheinschild, sophomore Allison Fleutsch and freshman Sara Runkel. Cutthroat senior striker Palmer provided the only goal in the first half. She ended up with two free-kick goals, her first scores of the season, and 44th and 45th of her four-year varsity career in the valley. Coach Richard Whitelaw's Cutthroat boys (0-0-2, 0-0-1 league) played to a 1-1 draw at Twin Falls on Saturday. Zach Lindahl scored the Sun Valley goal, senior keeper Tom Crosby made 14 saves and Cassidy Carson was named "Man of the Match" by his coach. Both Cutthroat teams hosted Bliss Tuesday in High Desert Soccer Conference games. Last Thursday the Cutthroat girls won their first High Desert league game 7-0 at Declo. Scoring were Ellie Swanson (3), Dies (2), Hayley Murach and Chloe Francois. Out-shooting Jerome 39-1, the Wood River High School girls' varsity improved to 4-0 on the young season with a 5-1 home Great Basin Conference victory over the Tigers on Monday at South Valley Sports Complex soccer field in Hailey. Samantha Sutton opened the scoring at 2:39 with an assist by Haley Montgomery. Senior midfielder Sloan Storey tallied her 21st career goal and fifth of the season at 5:46. Olivia Thornton scored her fifth goal at 7:30 on a Storey pass. Freshman Lucy Brannon was credited with the final two goals. Wood River improved to 18-0 in the eight-season series against Jerome, but missed its chance for a 14th shutout in those 18 games when Jerome senior Klynn Walker scored in the 50th minute. It was the first goal allowed by Wood River (22-1 goals against) this season. Also Monday, the Jerome boys kept Wood River winless with a 1-0 league win. Hailey's boys (0-3-0, 0-2-0 league) host Canyon Ridge today, Wednesday at 4:30 p.m. on the Hailey pitch. Canyon Ridge (4-1-0, 0-1-0) lost 4-0 at Minico (3-1-0, 2-0-0) on Monday. Previously Canyon Ridge won 3-1, 2-1, 4-0 and 4-1 over Pocatello, Century, Bliss and Wendell. The Wolverine girls travel to Canyon Ridge (3-2-0) today. 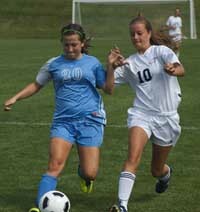 The Riverhawk girls defeated winless Minico 1-0 on Monday.